Is it time to upgrade your home? We believe you deserve the finest, most elegant vinyl siding in the industry. Fortunately, Window World of Baltimore carries the Prodigy® Insulated Wall System, the most advanced vinyl siding on the market. Available in a variety of styles, durabilities and colors, our vinyl siding is designed to provide you with the appearance of a real wood product, without the hassle of real wood maintenance. Suited to meet your needs, our vinyl siding reflects your lifestyle and gives you the freedom to live it. The Prodigy® Insulated Wall System also wraps your home in a blanket of insulation, protecting it against harsh Baltimore winters, humid summers and other severe weather elements. With maximum energy efficiency, your new vinyl siding is an investment that will save you money on energy bills for years to come. Browse our vinyl siding options, below, and contact us today for a free in-home estimate. Window World 4000 Energy Plus Vinyl Siding is designed to save you money. Weighing in with a 1-¼” insulating underlayment, this vinyl siding option boasts maximum energy efficiency, with a nearly unmatched R-value. When you install 4000 Energy Plus siding, your Baltimore home will remain protected from unwanted temperature changes, harsh weather and moisture damage. The Window World 4000 Reinforced Vinyl Siding is one of the strongest vinyl siding options on the market. Utilizing a tongue-and-groove locking system, this product has been tested to withstand the wind, rain and other harsh conditions associated with Category 5 hurricanes. Choose maximum protection for your home, and your family, with Window World of Baltimore. Window World of Baltimore strives to meet your needs in both affordability and functionality. A great value, the Window World 2000 Vinyl Siding provides you with the best of both worlds. Improve your curb appeal, protect your home from the elements and remain virtually maintenance-free, all at an affordable price. And, find peace of mind in the durability of your home, with the .044” thickness and sturdy lock design that this siding offers. Window World 1500 Vinyl Siding is a beautiful choice for any Baltimore home.Though designed to give your home a real wood appearance, Window World 1500 Vinyl Siding doesn’t require half the maintenance of real wood. Simply hose down your vinyl siding to keep it clean and enjoy the free time you deserve. Not to mention, you can take comfort in knowing your home is safe and sturdy with a reinforced, rolled-top nailing hem that offers the durability you need. At an affordable price, the Window World 1000 Vinyl Siding will not only provide you the functionality you need in your vinyl siding, but will also meet your unique design needs. 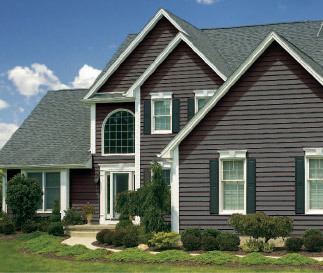 1000 Vinyl Siding offers outstanding performance, utilizing its rigid exterior and rolled top nailing hem. If you choose this product you will find that you receive the most for your money, and will be pleased with your vinyl siding for years to come. Don’t put off the upgrade your home deserves. With nearly unlimited vinyl siding options, Window World of Baltimore is ready to help you create the home of your dreams. Request a free in-home estimate today to begin choosing your vinyl siding style and color, or call us to learn more!